As I sat in my cozy office, drinking from a VMware mug, wearing a SearchVMware.com t-shirt under my dress shirt, saving drafts of a SharePoint training presentation to a 1GB USB stick emblazoned with eG’s logo and watching Jan and Hannah go through their big bag-o-stuff from the conference, I mulled over something … what was the one thing, above all of the other schwag, that I wound up using most? 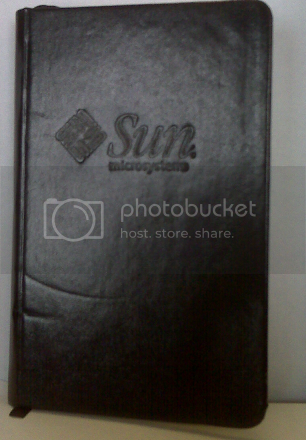 The answer was the lowest-tech item there: Sun’s little black book. So, the Completely Unofficial Best of VMworld Schwag Award (TM, patent-pending, Copyright 2008, all rights reserved) goes to Sun Microsystems for providing such an elegant and simple tool. A little black book beats outlook any day. Leave it to the people at Sun to know that. Came back across this today... Sun may be gone, but this notebook is still seeing service.